Finally - it's aliveee! But wait, is this even a viral? Barely. Come on Bad Robot, you guys can do better than a social media tie-in like this. In December of last year, before we had too many trailers or footage from J.J. Abrams' Star Trek Into Darkness, a viral site called "Are You The 1701?" referring to Enterprise designation NCC-1701 appeared. After many months of nothing but a stale logo and no changes, the website has finally relaunched with instructions and a social media widget. 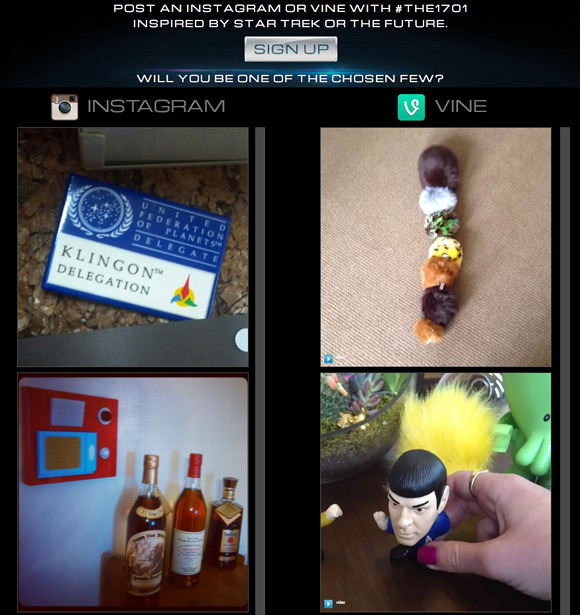 All it explains is: "Post an Instagram or Vine with #THE1701" as the tag to participate. Besides that, it asks: "Will you be one of the chosen few?" That's the only update on Are You The 1701? at the moment. As always, things are kept mysterious, without much info provided. Are they finding 1701 people, or just a few? And what will these few get to do? Will they join the crew on the Enterprise, or travel to the premiere, or participate in other parts of the viral? We'll see. Star Trek Into Darkness is the sequel to the J.J. Abrams-directed reboot of Gene Roddenberry's original science fiction series. The screenplay this time was co-written by Roberto Orci & Alex Kurtzman & Damon Lindelof. Most of the crew is back, including Chris Pine, Zachary Quinto, Zoe Saldana, Karl Urban, Simon Pegg, Anton Yelchin & John Cho. Paramount is bringing Into Darkness to theaters May 17th next summer. According to furiousfanboys dot com the movie is a disappointment. "And how did they get to see it all ready? "-it premiered in Sydney, April 23rd. If you go their site(furiousfanboys), the spoilers are in white txt, so you'll have to highlight them to see what they think about it. But they have related articles, so maybe just avoid it. Problem is, it's still over two weeks away be for it's in the theaters(May 10th here), the story and spoilers are bound to come out and spread like wildfire the next week, in various media. The Japanese trailer also showed off a huge clue. For someone who is so secretive about his stuff, why on earth is the movie premiering as early as April 23rd and as late as August 23rd(Japan)?? Looking at the official rules, it says they'll choose 1701 people that will each win a prize package with an approximate retail value of $2.00. Now I understand why they hid that detail deep in the official rules... not so impressive after all.